Regarded as “Stupefyingly Simple” and “most user-friendly video editing and sharing tool”, Givit Video Editor for iPhone is a fun and simple app to quickly make and share great videos on iPhone! Givit Video Editor handles with longer videos with an amazing ease via its very unique features and is a great app for cherry picking only the best and most interesting parts of life! Live Highlighting – allowing you to highlight critical moments while recording a live event with a simple tap, to recap back seven seconds, or start/stop record at any point. Multiple Clips – limitless number of video highlights that can be combined to create the final product. Moreover, users are able to even use Givit to edit clips created with great effects apps like Super 8, Vine or Action Movie FX! No length limit – without any restrictions, users can share videos of any length or size. Effects – you can add motion effects (slow-motion, speed-up), music and transitions to polish and finish the highlight reel. Titles and Photos - numerous stylish titles are available to help tell your story become more expressive. Social – for sharing your masterpieces to Givit so others can be inspired by your talent. Videos from others are also available, categorized carefully. You can also comment on videos or show some love by liking what other stars in the Givit community are creating. Sharing Options – social sharing to Facebook, YouTube and Twitter available with a single click! You can also share video privately and securely by email. Cloud Storage – for you to upload videos to the Givit cloud for permanent storage, or edit videos from any other source imported to Givit. "300" Effect – bringing a ton of fun by applying that awesome movie effect, speeding your scene up slightly, then seamlessly jumping to slow motion before finally returning to normal speed. Find and Invite Your Facebook Friends - you can see which of your Facebook friends are using Givit and follow them, and find some more useful options available for the Facebook icon on the "People" tab under "Explore". Scene Operations – including scene duplication or ability to split it into two parts for the ultimate creative flexibility and more expression. • Airplay Support - Watch any video in Givit on the big screen! • Long pressing on a transition will now allow you to change all of your transitions to the one you are pressing on. • You can now open music files in Givit with any app that supports "open in" for mp3 and m4a files. This is a great way to get music that you may not have in iTunes into your videos. Givit Video Editor in all its glory is available in the Apple App Store For FREE! 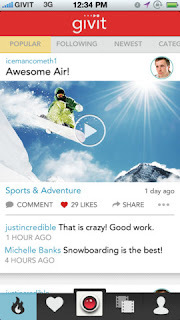 So go and grab this useful tool and quickly make and share great videos right on your iPhone!